Fully-revised for Australian and New Zealand medical-surgical nursing students, the second edition of Clinical Companion Medical-Surgical Nursing is a user-friendly, quick-find guide. Clinical Companion Medical-Surgical Nursing, 2nd Edition has been fully revised and updated to address situations Australian and New Zealand medical-surgical nursing students will most frequently face during their clinical placement. Common diseases and disorders are presented in a practical format – from cause, signs and symptoms through to diagnosis, treatment, complications and nursing considerations. The first local edition of the Clinical Companion was regarded as an indispensable quick-reference guide, and this new release will prove even more valuable; providing practical suggestions and helpful tips to assist with nursing care and learning outcomes, along with the useful new content. Each of the book’s 14 chapters has been fully revised to include the most relevant and up-to-date information. Appendices have also been enhanced, with new features including updated Life Support flow charts aligning with the 2010 Australian Resuscitation Council guidelines. Comprehensive yet succinct, the book’s convenient format makes it easy for nurses to carry; eliminating the need to lug around a hefty hardback on clinical placement. 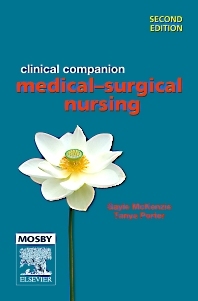 Clinical Companion Medical-Surgical Nursing is an essential reference for student nurses, and continues the ongoing success of the US editions. The book is also a must-have guide for graduates, as well as registered nurses re-entering acute care practice after a period of absence. Clinical Companion Medical Surgical Nursing, 2nd Edition is the ideal resource to accompany Lewis’s Medical–Surgical Nursing, 3rd Edition by Brown & Edwards, and the exciting new Lewis Medical Surgical Simulation Learning System ANZ adaptation – both of which will be available in October 2011.